What amazes me is this. 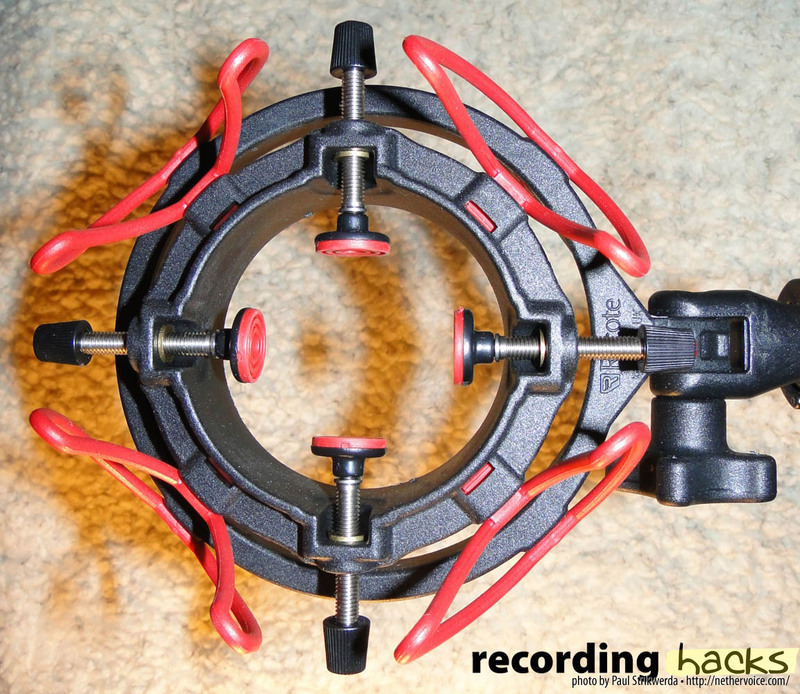 The most inexpensive mics often ship with a cat’s cradle suspension system, whereas some of the big boys demand top-dollar for shock mounts that are sold separately. It’s as if you’re buying a high-end mountain bike that does not come with a proper seat. I recently ran into that problem when I got my Microtech Gefell M 930 Ts. If you’ve read my review you know that I adore this nifty little thing. 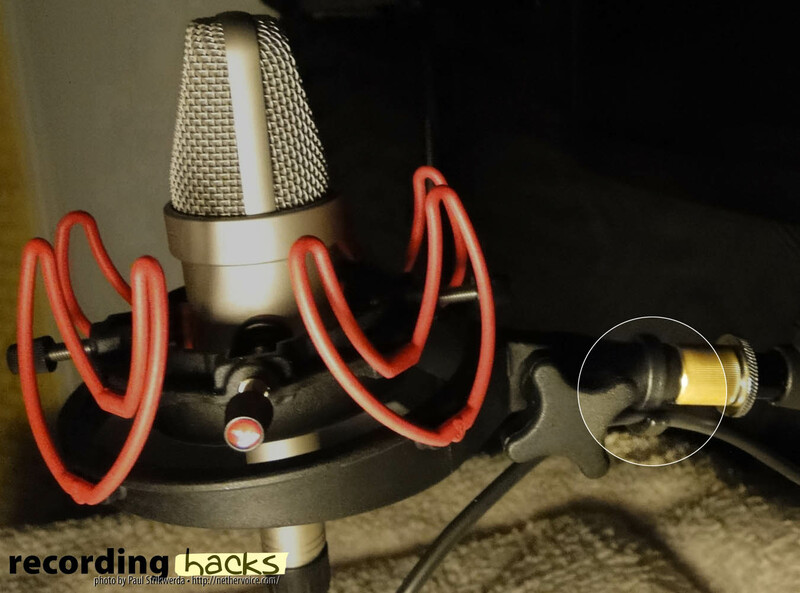 Because it’s a pretty sensitive microphone, a proper shock mount is no luxury item. It is a necessity. But here’s the thing: the M930Ts is an exceptionally small large condenser and does not fit into a regular shockmount. Of course Gefell will happily sell you the one they make, for a little over $300, but that’s just outrageous for a wire frame and some elastic bands. If you run a studio with a decent mic locker, it becomes a real pain in the you-know-what, to have to unscrew a unique shock mount any time you change microphones. Besides, these mounts are often the weakest link in the recording chain. They last for a couple of years and then they fall apart. Just look at them. It’s a last-century design with last-century materials. Sometimes, expensive microphones are just hanging there by a thread. Literally. In my quest for a more universal, durable and modern suspension, I stumbled upon Rycote, a family-run business in Gloucestershire, UK. Founded in 1969 by film and television sound recordist John Gozzard, the company became first known for its furry microphone windshields. Rycote’s shockmount is made out of lightweight plastic, and has an inner and an outer ring, just like the more traditional mounts. Here’s what’s new: the inner ring that holds the microphone is not suspended by elastic bands, but by four W-shaped Lyre™ clips attached to the outer ring. These clips are made from a thermoplastic material called Hytrel that is virtually indestructible. It won’t sag, it does not need to be rethreaded, and Rycote says it offers up to 12 dB more isolation from unwanted vibration compared to a more traditional system. And yes, they have the test results to prove it! The Lyre™ clips (red in the picture) are not the only part of what makes this shock mount both unique and universal. What holds the microphones in place is a miniature version of a Christmas tree stand: four screw clamps with rubber tips. 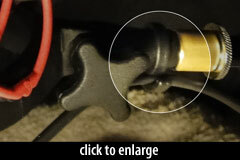 Attached to the inner ring, they can secure microphones of different sizes and shapes with very little effort. There are several versions of the InVision™ Studio line. 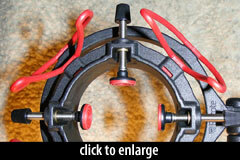 The regular USM (Universal Shock Mount) is for microphones between 1 and 55 mm, weighing 400–750 grams. The USM-VB (just introduced at NAMM) is for mics between 55–68 mm weighing up to 900 grams. My test model is the USM-L for mics between 18–55 mm, weighing up to 400 grams. Rycote’s compatibility chart (PDF) tells you which mount you will need for which microphone. My demo mount, an evaluation loan from US distributor Redding Audio, came just in time, as I was about to test several microphones, one of which was my small new baby, the Gefell M 930 Ts. 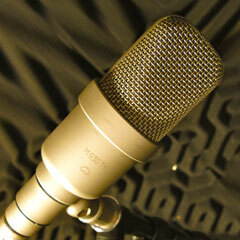 With the help of a 5/8 inch brass thread adapter (included) it was a breeze to attach the mount to the mic stand. In less than ninety seconds, my Gefell was safely suspended in mid air. I won’t say that you can’t screw this up because you have to. In the next few days I tried the InVision™ model on several microphones such as the more angular Lewitt LCT 640 and the more traditionally shaped Avantone CK6. Fitting these mics to the mount was simple, and at no point was I worried that the fasteners would lose their grip or crush the mic. Because my Gefell only weighs 273 grams, I used the USM-L (“L” for Lite) that comes with the red, more flexible Lyres. Whereas the other models can also be suspended horizontally or angled, the USM-L can only be used vertically or at an angle with mics up to 400 g.
Rycote also sells this shock mount as a Studio Kit which consists of a suspension system and a pop filter. The filter’s slightly curved frame can be attached to the outer support ring of the mount, but it will also lock tightly to most “spider” type elastic shock mounts. Thanks to a rotatable fitting, it’s easy to get the filter out of the way when swapping microphones. The oval shaped filter is made from super light mesh (an ABS nylon blend plastic), which is really a 10 mm thick open cell foam pad, held in place by a support ring. This foam can be easily removed for cleaning or replacement. I’ve never been a fan of pop filters held in place by a heavy metal clamp and a gooseneck. The less stuff I have in my field of vision, the better. Somehow, the clamp always seems to loosen its grip after a while, and I’ve had the whole thing come down in the middle of a live recording session. That won’t happen with the Rycote filter because it only weighs 45 g.
Having tested this filter in my voice-over studio for about a week, I can safely say that it does not color my voice at all. I no longer have to swap mounts when I swap microphones and unlike other filters, it stays in place. Pops are a thing of the past. At $149.99, I think Rycote’s InVison™ Studio Kit is very reasonably priced, especially compared to the more than $300 I would have had to fork over for a genuine Gefell shockmount. Not surprisingly, I am not returning my kit to the dealer. If you found this review useful, please consider supporting the site by purchasing through one of our affiliates. Paul’s kit, the USM-L, fits mic diameters 18–55mm and up to 400g in weight, while the standard USM accomodates heavier mics of the same size. The USM-VB is for mic diameters 55–68mm, with weights up to 900g. Another shock mount I’ve found is the M600 by Enhanced Audio in Ireland. http://www.enhancedaudio.ie However, it doesn’t have the W-shaped Lyre clips on it. But It does have a dual ring with screws. Perhaps more streamlined than the Rycote. Since you’ve handled this one I’d put my trust in you. Thanks for the review, Paul! 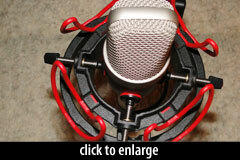 The red lyres are the most flexible ones for the lighter microphones. Rycote also uses black lyres for heavier mics. I have not tested the suspension system made by Enhanced Audio. By the looks of it, the idea of clamps to hold the mic in place is identical. Looking at their pictures, I cannot detect an actual suspension system, but I might be wrong. 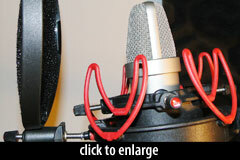 If you’ve seen Enhanced Audio’s pricing, you must have noticed that the Rycote shock mount is not nearly as expensive. Rycote makes some great products. It’s especially encouraging to see them create a new kind of suspension with Lyre. They get a lot of right, but I can’t believe how much acoustical interference that monstrosity must cause. The support ring is huge! The lyre suspension nearly blocks the direct path to the capsule. The mic needs to be free from obstruction. These mounts need to be made of something stronger so less material can be used and sound freely reach the microphone without refraction. Compared to the more traditional shock mounts, the Rycote solution is by no means as huge as you might think. It may look bigger because the microphone in the picture is actually very small (see my recent review of the Gefell M 930 Ts). The capsule is raised above the lyres, and I didn’t notice any audible signs of obstruction. The only thing obstructing a direct path to the microphone is the pop filter and that’s the way it’s supposed to be. I’ve got one USM and one USM-L. They’re the most practical, efficient, and sturdy shockmounts I’ve ever handled. They aren’t bigger than most traditional “cat’s cradle” shockmounts and the suspension system isn’t really in the way of the capsule, even with microphones as small as my M930 art (which is slightly shorter than Paul’s M930 Ts). 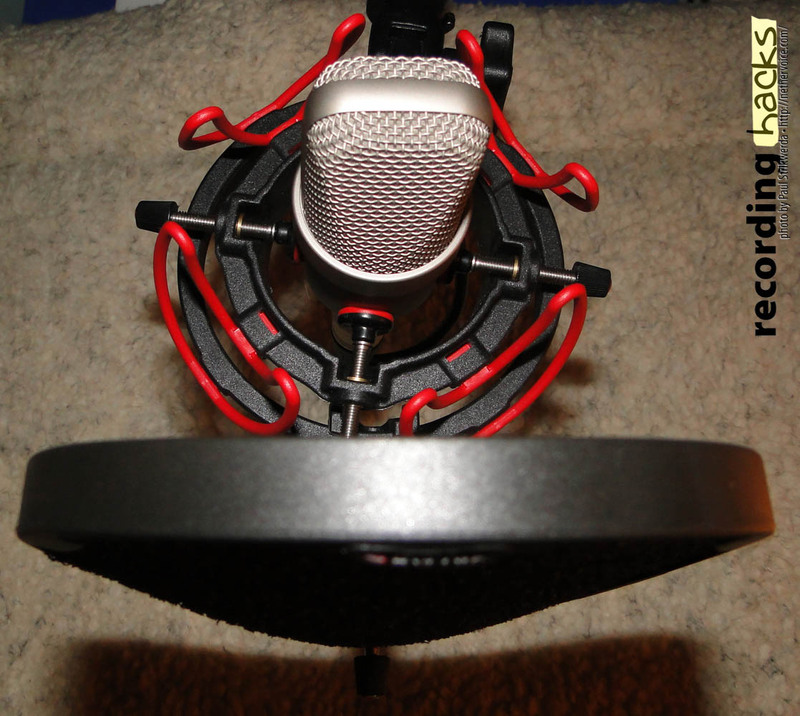 Back to Rycote: The pop filter attachment works great, too, and its large-cell foam screen is more efficient and transparent than traditional metal or nylon screens (though less traditional designs, such as that of the JZ|PF, are also worthy of consideration). Finally, Rycote’s customer service is one of the very best I’ve ever experienced, and I’m not saying this lightly. Caroline Mougenot has been a real pleasure to deal with. They also use velcro to attach it to the mic. The thing is, one can make a very discreet suspension system and have a huge pop filter block the field of vision. I think Rycote got it just right. Plus, it looks extremely cool, doesn’t it? The appearance of the Rycote kit is just okay, in my opinion. Traditional or semi-traditional shockmounts can easily look better (the one Neumann made for the TLM 102, for instance). But Rycote’s are not really ugly and they win on efficiency (always) and practicality (most often), so … they *are* cool. Another important difference is that Rycote’s and Gefell’s pop filters are attached to the shockmount, while Charter Oak’s is attached to the microphone itself. While I’ve no personal experience with this set up, I know people who don’t like when the pop filter is attached directly to the mic. Why? 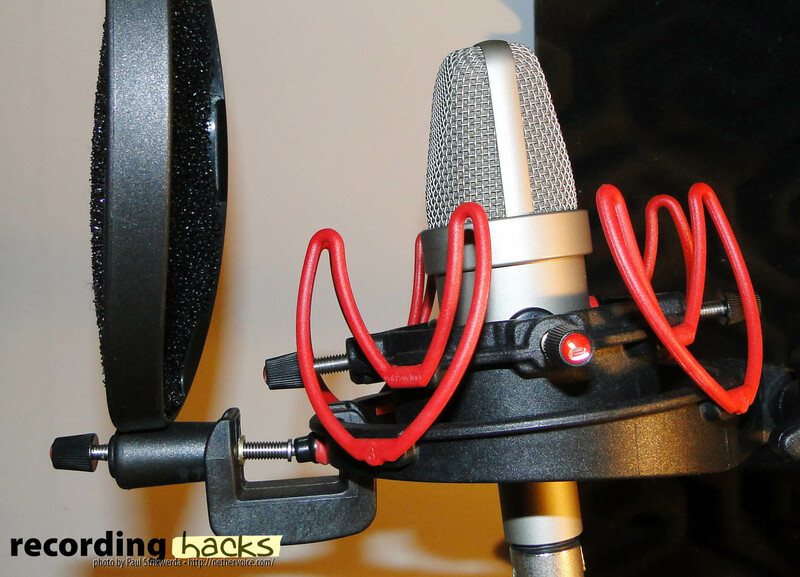 Take a conventional pop filter with a gooseneck. Blow on it (or speak plosives in front of it). You’ll see it move. Now imagine this pop filter attached directly to your microphone: the motion born from your breath would be transmitted to it, as small vibrations. Many thanks for the additional info, Pierre-Alexandre. I think you’ve made some valid points.